It is not a coincidence that Tunisia was the first country of the Arab Spring. I believe that Tunisia will be successful in presenting a successful democratic model because we have a homogenous society, with a small Jewish minority. Education is widespread; we have a large middle class which supports democracy. We have a moderate Islamic party, which has been one of the champions of the idea of the compatibility between Islam and democracy. There is a problem there that hasn’t been solved yet. There is a problem with occupation. So far, Israel has failed to reach an agreement — with [Yasser] Arafat in the past and Abu Mazen [Mahmoud Abbas] now. We hear that even Hamas is supporting the idea of a two-state solution, but we don’t see Israel going towards this solution. 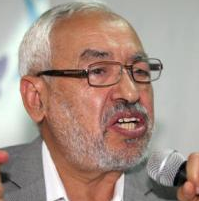 In May 2011, we published an English translation of an interview with Ghannouchi in which he clearly says that “Israel will come to an end sooner” than predicted.